Home About Us Faculty Shireen Madani Sims, M.D. Dr. Madani is a “Quadruple Gator!” She attended the University of Florida for her undergraduate degree and for medical school. She then completed her residency training at the University of Florida before joining the faculty in 2005. Dr. Madani’s professional interests include medical education as well as general obstetrics and gynecology. She previously served as the Chief of the Division of Gynecology, Gynecologic Surgery, and Obstetrics. Dr. Madani’s clinical practice includes general and high risk obstetrics, and medical and surgical gynecology. She has been a certified DaVinci robotic surgeon since 2008. Her areas of interest include abnormal uterine bleeding, fibroids, pelvic masses, management of abnormal Pap tests, gynecologic care of women with breast cancer, minimally invasive surgery, and general obstetrics. In addition to providing clinical services, Dr. Madani specializes in medical education, and has been recognized as a national leader in this field. She considers the opportunity to teach and mentor residents and medical students to be one of the most rewarding aspects of her job. 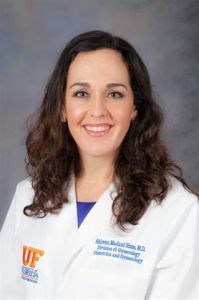 At the University of Florida, she serves as the Clerkship Director for third year medical students, and as the Director of Patient Centered Education in the Office of Medical School Admissions. She has edited two exam preparation books that are widely used by medical students across the country. Dr. Madani speaks nationally about various education topics, and serves on several expert national committees. She is an active member of the Association of Professors of Gynecology and Obstetrics (APGO), which is the primary organization for OB/GYN Educators. She is a 2011 graduate of the prestigious APGO Scholars and Leaders program. She has been appointed to APGO’s national committee that oversees medical student education, the Undergraduate Medical Education Committee (UMEC). She has also been appointed to APGO’s Testing and Self-Assessment Committee. In addition, Dr. Madani is an examiner for the American Board of Obstetrics and Gynecology (ABOG). She has been selected by ABOG as a “Subject Matter Expert, ” where she helps to identify and develop requirements for competent practice for OB/GYNs across the nation. Throughout her career, Dr. Madani has been recognized as an outstanding educator, both at the University of Florida and nationally. As a resident, she was twice awarded the Hugh Hill Teaching Award, which recognizes the most outstanding resident teacher in the College of Medicine, as voted by the senior medical class. In 2008 she won the J. Lee Dockery, M.D. Teaching Award, awarded to the most outstanding teacher in the OB/GYN department. She consistently receives the annual College of Medicine’s Exemplary Teacher Award. She earned the Outstanding Clerkship Director Award in 2013, and that same year she was inducted into UF College of Medicine’s Society of Teaching Scholars, a society whose members have demonstrated interest in and dedication to medical education. Dr. Madani has also earned several national teaching awards, including the Council on Resident Education in Obstetrics and Gynecology (CREOG) National Faculty Award in 2009, the William Herbert Promising Educator Award in 2013, and the APGO Excellence in Teaching Award in 2015. Dr. Madani is board certified in Obstetrics and Gynecology, and is a Fellow of the American College of Obstetricians and Gynecologists. She has been listed in “Best Doctors in America” annually since 2015.